Hosted LISD mail is a web-based application for LISD educators that comes with Google Apps for Education. LISD Hosted Mail provides you with 25,600 MB of storage space. This is significantly more space than has been available for email in the past and is accessible 24/7 from any Internet accessible device. Locate a link to email from your campus jump page or type the url: http://mail.lisd.org. If you arrive at this screen below type in your username and your network password. Click Sign in.Note: When you access email from this login screen you do not have to enter the @lisd.org at the end of your username. If you arrive at this screen below type in your full email address, for example, jdoe@lisd.org, for your username. Enter your district network password for the password. Click on the Gear icon in the top right-hand corner of the screen. Select Display Density as Compact. This enables ease of scrolling in your Mail Menu. Click on the 'Gear icon a second time. Click on the Inbox Tab at the top of the screen. Change Importance markers to No markers. Click on the Gear icon again. In Search for a lab box, type Inserting Images. Locate Inserting images in the list. Click Enable. In Search for a lab box, type Right-Side Chat. Locate Right-Side Chat in the list. Click Enable. In Search for a lab box, type Signature Tweaks. Locate Signature Tweaks in the list. Click Enable. 1. Access to Google in Education Apps, such as Drive, Calendar, Sites, etc. 2. Search messages by keyword. 3. COMPOSE = Create New Message. 4. Preview first line of message. 5. Personal Folders are always available. Click on any message in your inbox to see the symbols defined below. Return: Click this icon to return to the list of messages. Archive: By clicking this icon a message is placed in the All Mail label/folder listed on the left hand side under More. The message is not deleted, but will not show in your main Inbox. It will only show in All Mail. Move: You can create labels, also referred to as folders, that you can move mail messages to, just as you have done with personal folders in MS Outlook. The difference is these moved messages are accessible on the web 24/7. Print: Use the print icon to print your email. The email will open in a new window, then select File>Print. Note: Do not use the Print option from your Browser's File>Print command. If you do this you will be printing everything on the LISD mail page including label, etc. 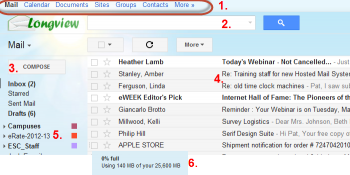 Click Compose button to create a new mail message. b. Begin typing the first few letters of the recipient’s name. The LISD Directory will display possible recipients from which to choose. Type more letters if needed. When the recipient’s name is highlighted in the list press Enter. Compose your message. Begin typing here. Check Spelling of your message. Click Attach a file to include a document with your email. There are two locations in an open message for choosing Reply or Forward. Option 1: Reply to or Forward icon located at the bottom of message. Option 2: Reply to or Forward icon is also located in the top right corner of the message window. An email signature is a few lines of text placed at the bottom of outgoing mail. It often contains the sender’s name and contact information. Click the Settings gear. Click on Settings. 2. Under Signature select the second radio button. 3. Click inside the text box and press the Enter key twice. 4. Type the desired signature in the text field. • It's best to keep your signature to five or fewer lines. 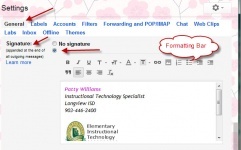 • To add formatting use the formatting toolbar. Note: There is no spell check on the Signature line so read carefully before you save your changes. 5. Click Save Changes at the bottom of the window. 1. Click the Settings gear. Click on Settings. 2. Click the Labs tab. 3. Type Signature Tweaks in the search box. 4. Make sure Enabled is selected under Signature tweaks. You can organize your email messages into folders, which LISD Hosted Mail calls “Labels”. This is similar to Microsoft Outlook Personal Folders. Access your LISD Hosted Mail account. Click the word More at the bottom of the list on the left-hand side. The list will expand. Type a name for the Label/Folder. The Label/Folder is now added to your list on the left-hand side of the screen typically in alpha order. Click the down arrow to the right of the Move icon to view a drop down list. Select the Label/Folder where you want to move this message. The message will immediately move into the Label/Folder you selected. It will no longer be listed in your Inbox. Click the down arrow to the right of the Move icon to view a list of options. Type in the Label/Folder name. Put a check in the box in front of Nest label under:. Select the Parent Label/Folder from the drop-down list. The Sub-Label/Folder is now created and your email message has been moved.